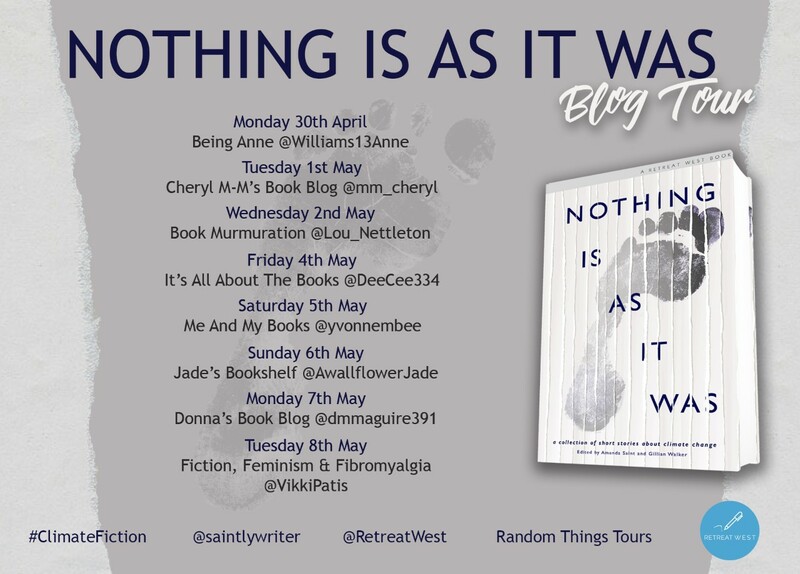 I am delighted to be taking part in the BlogTour for Nothing Is As It Was. It is a collection of short stories about climate change – edited by Amanda Saint & Gillian Walker. I believe it is an incredibly interesting topic, which these authors have managed to make relatable and interesting. Using flash fiction and short stories to get their point across is an effective way to engage the reader without them losing interest, especially because each one of them has such an individual approach. This is a collection of flash fiction and short stories on one of the most important topics of our time – climate fiction. This collection is raising funds for the global climate action group, Earth Day Network. In the foreword Amanda Saint speaks about the importance of climate change and getting more people or readers to comprehend the importance of this topic. We are living in a world split down the middle when it comes to this particular topic. Many people, including those in the highest political positions in the world, are climate change deniers. No matter what scientific evidence is presented or even actually being able to see the difference in weather patterns, some people would rather leave the planet to self destruct instead of implementing changes to ensure our survival. Mirror Image by Anna Orridge – ‘Give Nature a chance, and she will return.Head held high.’ Mirror Image is anything but a pretty flash into the future we can expect. One in which the malice of our base human nature shines through in the guise of survival. Me and the Mountain by Vicky Ridley – ‘Earth’s guttural cries of agony’- An interesting premise. Is earth speaking to us? Crying out for attention? Pleading with us to stop destroying her, using her voice to communicate the frustration she feels at the destruction. Portal by Philip Sobell – This is definitely a tongue-in-cheek sign of the times story, and the sad thing is I can see this happening. Without any shadow of a doubt the human race would, after determining no real value or solution for the Portal, use it to dispose of a problem. Sad, but true. No-Car by David McVey – Separating the wheat from the whey, the poor from the rich. Unfortunately this reality is already upon us. When the car becomes the luxury item, as opposed to the common item to own. Public transport being re-delegated to that of the poor, and class structures taking on more immense proportions. Begs the question, whether those who choose to save the environment now with a no-car choice and inadvertently moving themselves into that position already. Food for thought. Sun by Wiebo Grobler – Will it descend into complete chaos? Good question, but what is more intriguing in Sun is the fact that we just stand by and accept our fate. Isn’t that what we are doing already? Warrior by F E Clark – I love the Author’s Note on this: Written in response to reading that The Oxford Juniour Dictionary had deleted nature words – particularly the names of flowers. The eco-warrior will become one of the most important elements of our future. Just saying. Graduation Day at the Fishmonger’s Institute by Anne Summerfield – This doesn’t just speak to climate change, it is already indicative of the times we live in now. So many career paths have disappeared and become extinct. It is a downward trend when it comes to survival. One day there will only be holographs or pictures of certain species perhaps we will be one of them. The GoodLuck Camera by Kimberly Christensen – This story is prophetic. This is what will befall the majority of us if the water levels continue to rise. Our grandchildren or great-grandchildren may never know the abundance of food and water, or the feeling of sand between their toes. The Other Side of Me by Norman Coburn – How important are the people who can envisage the future and are trying to change the outcome for every one of us? Bottleneck 2048 by Neil MacDonald – ‘It was too late for precautions, much much too late.’ This is the reality of our situation. Even if everyone was less interested in profit and making the rich even richer, and the deniers were finally taken to task, the process is already well underway. Healng AthaBasca by Keygan Sands – Poetic and sad, with the ultimate grand gesture, albeit an empty one, but at least it is one that ignites the fire inside of the girl who sees the destruction around her. The Arctic Commandments by Cath Barton – The desperation of knowing there is no solution, and when nature takes over is it not better to let it take you and end that sense of your inevitable demise? I am Stealthy, I am Swift by CJ Conrad – Is this what awaits us in the end. Will we return to the hunter, gatherer mode? Will extreme survival remove generations of societal norms? New Moon by Dave Murray – We are complacent and we are in denial, at least a fair number of us. At the moment we are at a stalemate, that period in time just before the next wave comes. Like a Captain of Old, Going Down with the Ship by Fiona Morgan – We will become a collection of memories and executable files. The far-fetched notions from popular space fiction movies, where they watch back history on recorded tapes. That will be us one day. Blue Planet Collection by Jane Roberts- It starts with one boy. Imagine if we all did our part to make sure the fish can swim unhindered in the oceans. The oceans filled with waste and plastic. Come and Gone by Angelita Bradley – ‘Like a chance to make things better has come and gone.’ That is it in a nutshell really. We have been given enough warnings and plenty of opportunity to change the result. The Warming by Karen Morrow – The land is being consumed by the oceans. Without it we become Waterworld. Salvation is the object we poison, and in return poisons us. Plenty More Fish in the Sea by Luke Strachan – The thing with evolution is that the majority of species adapt to their environment, so it isn’t to far-fetched to think that some may survive over others. In that there is potential and hope. Hasta La Vista, Babsy by Fee Johnstone – This is a cute little story, and perhaps one that explains more than just whales getting lost and being beached because the currents are changing. Species securing their survival by making their genetic strains more adaptable to the changing environment. Perhaps animals are a lot smarter than us,because they trust their instinct. Walking with the Weather by Rob Walton- Short, poignant. What good is a petition, a piece of paper or electronic trail that no person pays any attention to? Too Late by Ros Collins – The empty promises of politicians, who are too concerned with fame and notoriety than with the facts of the situation. You are doing yourselves a disservice if you are governed by a politician who chooses to ignore the inevitable. Where Lies the Line by Taria Karillion – ‘Two sides of the same tool of change.’ Unfortunately the human species is a selfish one and one that secures survival before that of others. Not even faith can change instinctual behaviour patterns. Airpocalypse by Rachel Rivett – The air we breath may soon become a commodity, an illegal one at that. Even now there are cities and countries covered in smog so thick you can cut through it with a knife. We take it for granted. New Shoes by Charlie Hill – This story is indicative of our society and the way we place property before lives, millennial are especially guilty of this. What matters the nice pair of shoes when death is looming at the front door? Thirst by Lorraine Wilson – Wouldn’t you do anything to save your child? Break the law and steal from others to secure their survival. In a world full of bureaucrats who care nothing about black and white names on paper. Deluge by Susmita Bhattacharya – Deluge remembers the victims of the unpredictability of Mother Nature. Climate Change is reaping lives like a wanton seeker of souls. Collecting his dues for supposed past indiscretions. She takes the innocent, the young and the blameless. Fireworks by David Barker – The animals are encroaching upon our territory. The hunter becomes the hunted, especially when the race for survival becomes an equal one. Ophelia Rising by Elaine Desmond – The banality of life in general supersedes the overall concern we should have for our survival. Affairs, betrayal and emotional upheaval all blitzed by the majestic power of Mother Nature rising to challenge us. The Window Box by Stephen Connolly – This is a chapter from his current novel-in-progress. I can honestly say that based on this short introduction it is one I would pick up to read. The setting is a drab dystopian world of dog eat dog. Survival of those who abide by the rules of big brother and are threatened by the steady presence of the almighty Poseidon. Up Above the World so High – ‘The distinction between night and day is disappearing in the most heavily populated regions of the Earth.’ Knowing what we do about biological clocks and the impact it has on physical and mental health, I am surprised this isn’t a better known fact or discussed fact. Although the stories have a common denominator, they are all incredibly different. The fact that they are short actually helps the reader to take on board more information. It is like watching an art display of flashbacks or photographs being projected onto a wall for five minutes at a time. In a time where the masses are being given conflicting information about climate change, and it has certainly fallen prey to the false news propaganda groups, it is important to try and change the perspective of this issue. The global companies who control our energy resources are really invested in trying to convince the common man and woman, that climate change doesn’t exist. That the extreme weather, the change in seasons, the change of climates is but merely a natural evolution of earth. It isn’t. We are destroying our habitat, our species and other species. We have probably already passed the point of no return and the inevitable, but that doesn’t mean we should give up. We should at least try to sustain the planet we live on for future generations. Nothing Is As It Was is an ode to the planet and at the same time a call to rise up and do something, even if it is just that one small thing you can do for your environment. Buy Nothing Is As It Was at Amazon Uk or go to Goodreads for any other retailer. No-Car by David McVey – David McVey lectures in Communication at New College Lanarkshire. He has published over 120 short stories and a great deal of non-fiction that focuses on history and the outdoors. He enjoys hill-walking, visiting historic sites, reading, watching telly, and supporting his home-town football team, Kirkintilloch Rob Roy FC. The GoodLuck Camera by Kimberly Christensen – A resident of the Pacific Northwest, Kimberley Christensen writes about all things sustainable-from organic gardening to breastfeeding to waste reduction. After a number of years working for CoolMom, Seattle’s first climate nonprofit focused on women and families, she recently left her position to write in climate fiction. She hopes to introduce readers to the personal side of climate change. The Other Side of Me by Norman Coburn – Norman Coburn is a novelist and short story writer based on the East coast of Scotland. Steering clear of crime fiction, he writes mystery stories anchored in nature and Scotland’s rich mythology. Living and working by the sea he’s watching the gradual affects of climate change through changing patterns of bird and fish migration. He likes his stories to be gritty but seasoned with hope. I am Stealthy, I am Swift by CJ Conrad – CJ Conrad is a deaf, overweight forty-something who believes he will be forever seventeen. He likes dogs, food and welding but not in combination! C also believes that tea is the greatest drink in the world, and that the world would be a far more peaceful place if everyone made room for a brew and a biccy! New Moon by Dave Murray – Dave Murray is a Manchester based writer of plays , poems and short stories. Blue Planet Collection by Jane Roberts – Jane Roberts is a freelance writer living in Shropshire, UK. Her fiction is published in a variety of anthologies and journals including; Litro, Bare Fiction Magazine, The Lonely Crowd, Wales Arts Review, LossLit Magazine, Flash: The International Short Story Magazine, NFFD Anthologies, 100 Stories for Haiti, Stories for Homes, Refugees Welcome Anthology, and Unthology 9 (2017); Bridport Prize Flash Fiction (2013/2016), Fish Short Story Prize (2015/2016) and Flash Prize (2016). She is one third of Literary Salmon (Saboteur Awards Longlisted, “Best Anthology” 2016) and is a participant in the Writing West Midlands’ Room 204 Writer Development Programme 2017/2018. Hasta La Vista, Babsy by Fee Johnstone – Fee Johnstone is managing editor of a medical journal and lives in Scotland. She enjoys writing short stories and flash fiction and came third in the Magic Oxygen Literary Prize, ‘the greenest writing competition on the planet’ in 2016 but is still convinced this was an admin error. She has a few pieces scheduled for publication in some awesome zines (Paper and Ink, Razur Cuts, Ellipsis and Ghostland). To combine her love for cats and craft beer, she’s working on teaching her feline friends to pour the perfect stout. Walking with the Weatherby Rob Walton – Rob Walton grew up in Scunthorpe, and now lives in North Shields. His short fiction and poetry for adults and children appears in various magazines and anthologies. His flashes have been published by 101 words (US), Bangor Literary Journal, Flash Frontier (NZ) Ham, Ink, Sweat & Tears, Number Eleven, Paper Swans, Popshot, Pygmy Giant, Reflex, Spelk and others. He is a past winner and current judge of the UK’s National Flash Fiction Day micro-fiction competition. Too Late by Ros Collins – After twenty-five years of teaching, Ros retired to the seaside town of Felixstowe with her husband, where she enjoys her hobbies of writing, reading, tennis and blustery walks. She as been short listed in several competitions and came second in the inaugural Reflex Fiction competition. The subject of climate change holds both a fascination and a horror for her. Fireworks by David Barker – David was born in Cheshire but now lives i Berkshire. he is married to an author of children’s picture books and they have a daughter who loves stories. David spent 26 years working in the City as an economist, trying to predict the future. His first novel, Blue Gold, was published by Urbane last year and the sequel, Rose Gold, comes out in May. the final part of the trilogy is due in 2019. Elaine has a Certificate in Creative Writing from the Writers Bureau in the Uk and has had articles published in newspapers and magazines. Her short stories and poems have been runners-up in a number of literary awards. In 2008, she wrote a one-act play entitled A Footprint of Roses about WOZA, a women’s civil movement in Zimbabwe. This was produced throughout Europe and the United States and is available online. Elaine is a member of the Virgin Slate Writers Group and the Corccodorca Theatre Development Company, both in Cork. This entry was posted in Anthology, Blog-Tour, Climate Fiction, Flash Fiction, Short story and tagged #RandomThingsTours, Anthology, Blogtour, Climate Fiction, Flash Fiction, Nothing Is A It Was, Retreat West, Short stories.